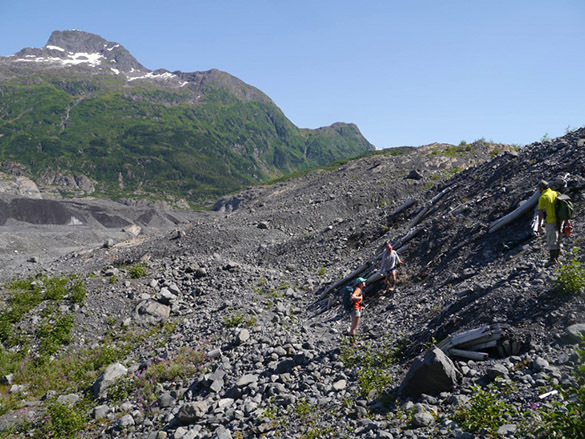 Wooster Geologists » Blog Archive » Team Columbia returns in high spirits with bountiful samples! Team Columbia returns in high spirits with bountiful samples! I.S. 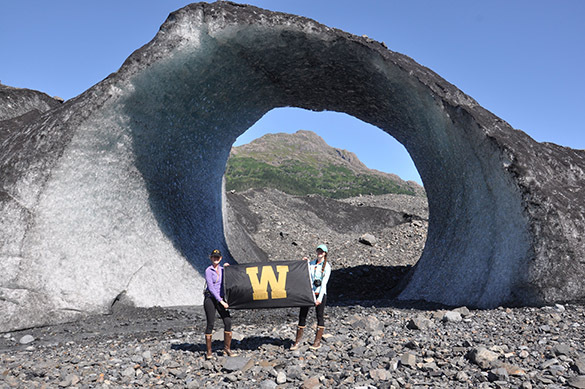 students, Kaitlin and Maddie enjoying the sunshine and representing Wooster below a fascinating ice tunnel. Team Columbia is back from an exciting 8 days in the field. Dr.Wiles, Nick Wiesenberg, Maddie Happ and Kaitlin Starr traveled via helicopter to Columbia Bay, Alaska beginning July 15th and returning July 21st. The first half of the trip was spent on the West Branch of Columbia Bay. Despite rainy days and blustery winds, we accomplished quite a bit of work! During our time on the West Branch, the team updated an old growth site, known as the Rock Tor, and collected samples from another living tree site near Kadin Lake. 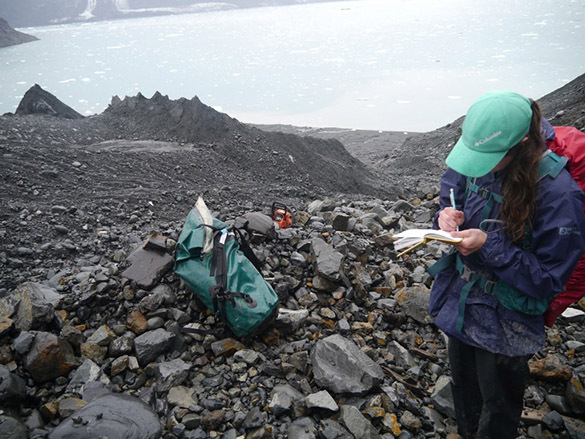 In addition to these living tree samples, the team collected cores and cross sections from newly exposed wood that were killed during the initial advance of Columbia Glacier. Kaitlin recording sample numbers and GPS locations at our first site. On July 18th, we were transferred across the bay to a location known as the Land Lobe. 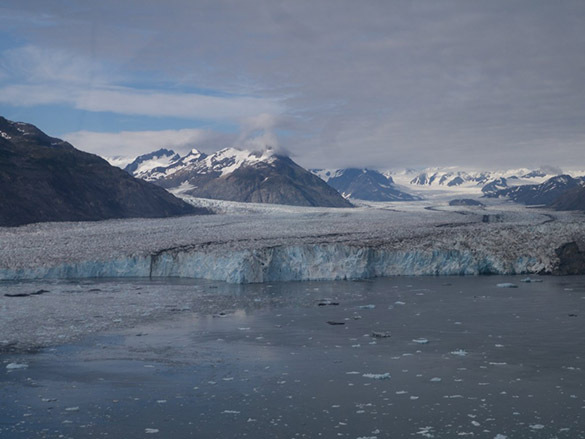 The team created base camp on the Great Nunatak side of the Land Lobe, as opposed to past years when groups were limited to the moraine due to the previous glacier terminus. Finally, the weather gods were on our side, and abundant sunshine allowed for productive days. We collected samples from the fans surrounding our base camp. On our last night in Columbia, we climbed to the tree line to update another living tree site titled the Son of the Great Nunatak. The alpine forest made for a wonderful last dinner in the Alaskan wilderness. On our final morning (with great weather still hanging on), Dr.Wiles and Nick recieved helicopter support to jump across the river to the other side of the Land lobe, where they collected newly exposed samples to complete a previously sampled site. Team Columbia enjoying sunshine and exploring sites at our second camp near the Great Nunatak. Team Columbia encountered a few minor setbacks throughout the trip, including gritty oatmeal, killer porcupines, and constant stumbling (particularly near waterfalls); however, it was a fabulous adventure overall! I.S. students, Maddie and Kaitlin are excited to return to the Wooster Tree Ring Lab and begin exploring the great stories behind these logs. Photo of the East Branch of Columbia Glacier captured from the helicopter. What a fantastic time you had, and with what looks like perfect weather! We’ll have to wait until you return to learn about the killer porcupines! Glad to see the adventure continues!